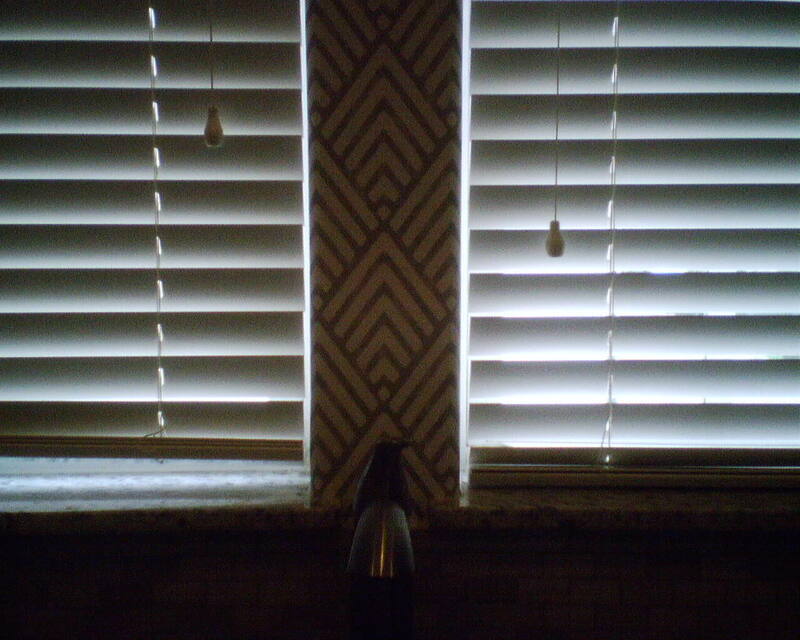 Most homeowners don’t notice things like this, but when the interior designer for this dining room in the Houston Heights walked into the room, the first thing she said was, “I love the way the pattern falls perfectly in the middle between the two windows. And I love how it hits at the ceiling line and just above the tops of the windows.” Yeaay – she gets it! 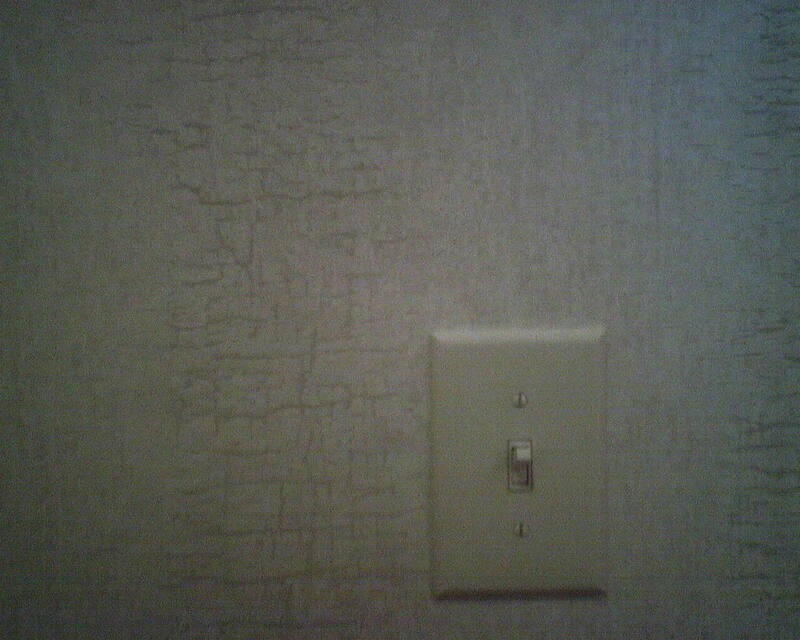 I was flattered when the designer noticed the placement of the pattern on this wall, because I had put a lot of time and engineering into it. 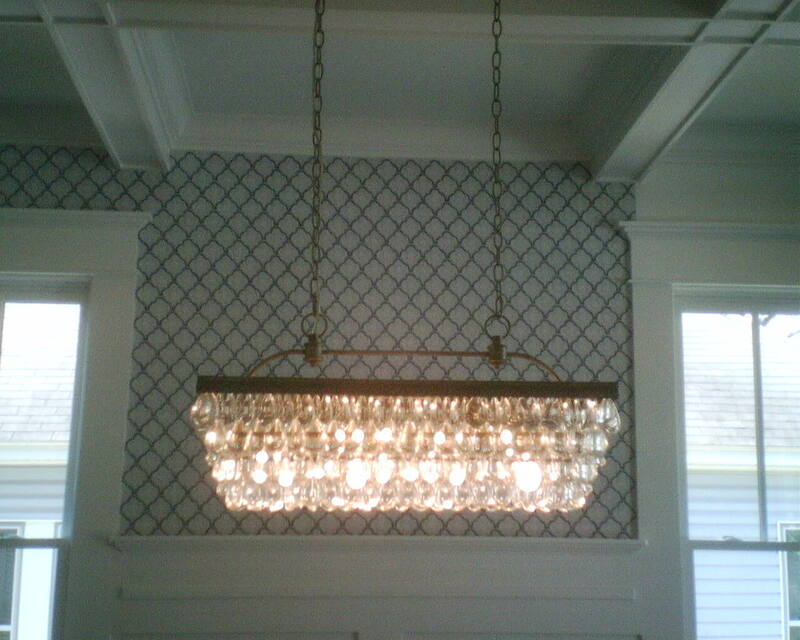 Using math and pencil and rulers and a laser level, I also balanced the pattern vertically, between the crown molding and the wainscoting. 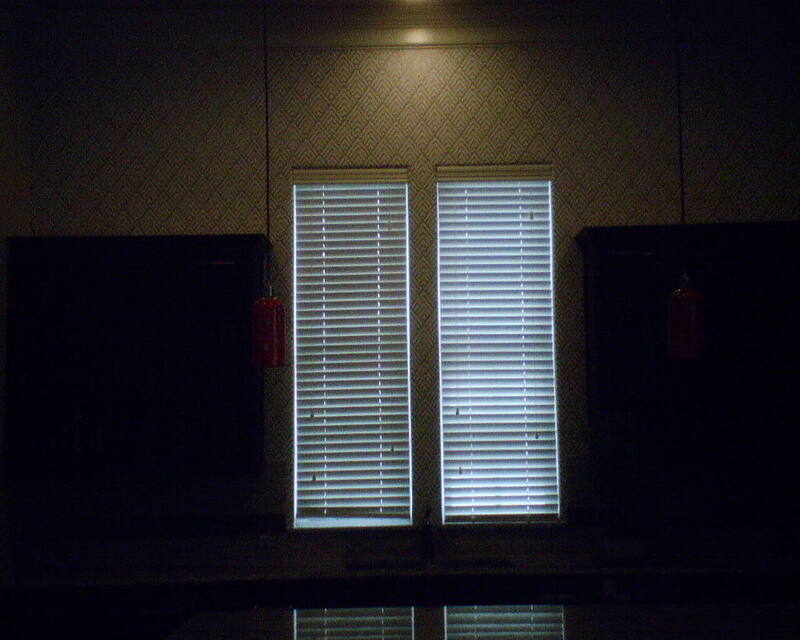 Because much of the wall space in this room was above the doors and windows, it was important that these short areas be equally well planned, so the pattern motif would appear uniform over every opening. I hope I will work with her again soon. Her name is Stacie Cokinos. Certain papers call for special adhesives. 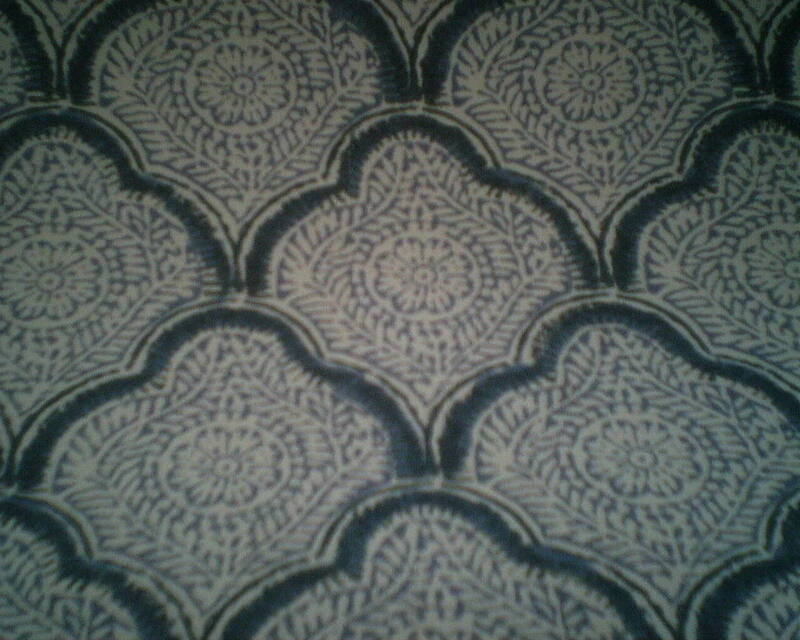 “Back in the day,” all wallpaper was hung with powdered paste. Today, some papers still do better with these types of paste. Some of the options are wheat, cellulose, or potato starch based. They are less tacky, more slippery, and less likely to stain delicate materials. “Back in the day,” paperhangers used a wire whisk and a lot of elbow grease to mix these pastes with water into a smooth consistency. My modern day trick is to use an immersion blender. It’s much faster and really gets rid of the lumps! 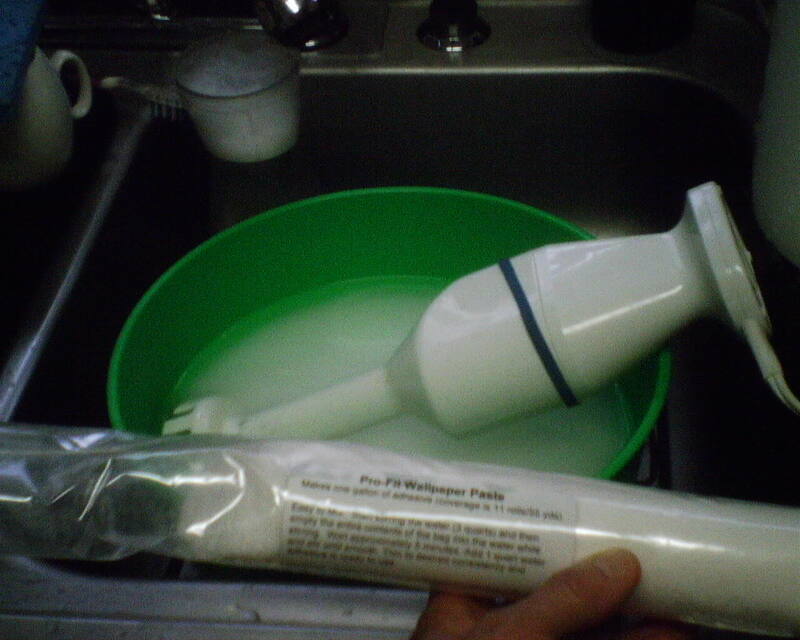 After mixing, the paste must be allowed to sit for a period of time, to completely absorb the water, and then be stirred again, with more water or powder added as needed. Eco-Fix is a potato starch based paste that can be bought from Bradbury & Bradbury (http://bradbury.com/). Wheat and cellulose powdered pastes can be purchased from Bob Kelly at paperhangings.com. I always try to keep some on hand, for the rare occasion when a job calls for this type of special paste. 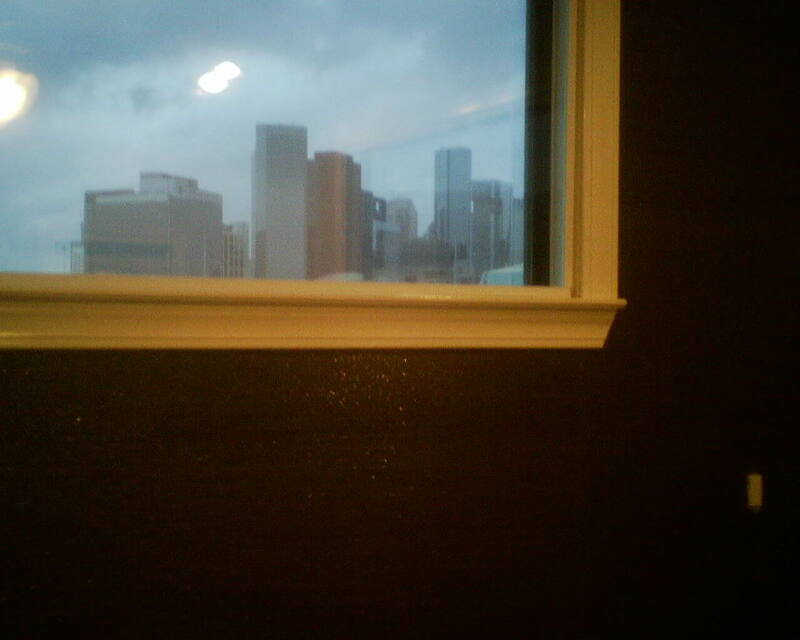 The homeowner bought this townhouse just east of downtown because of the incredible view of the Houston skyline. He especially likes the way the buildings sparkle at night. 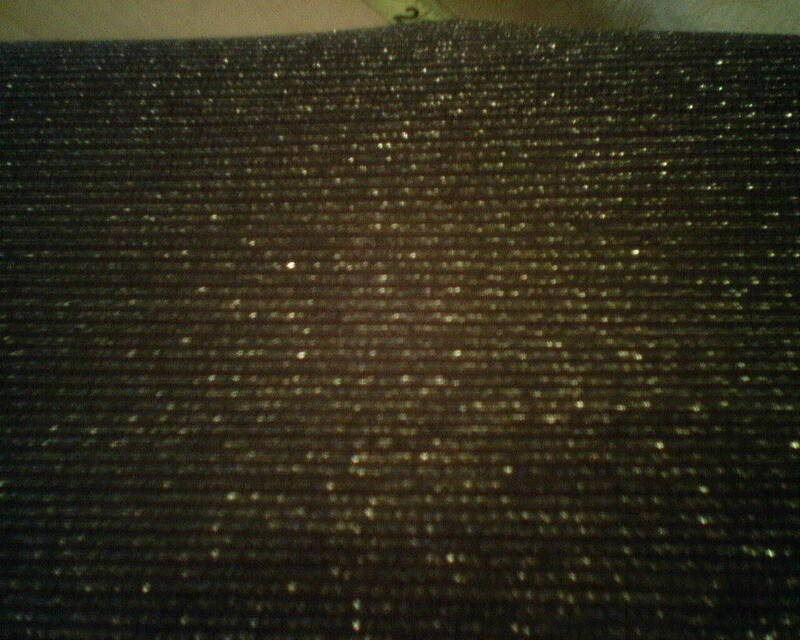 He chose this dark brown grasscloth with lots of glitter because it accentuates the view out his bedroom window. 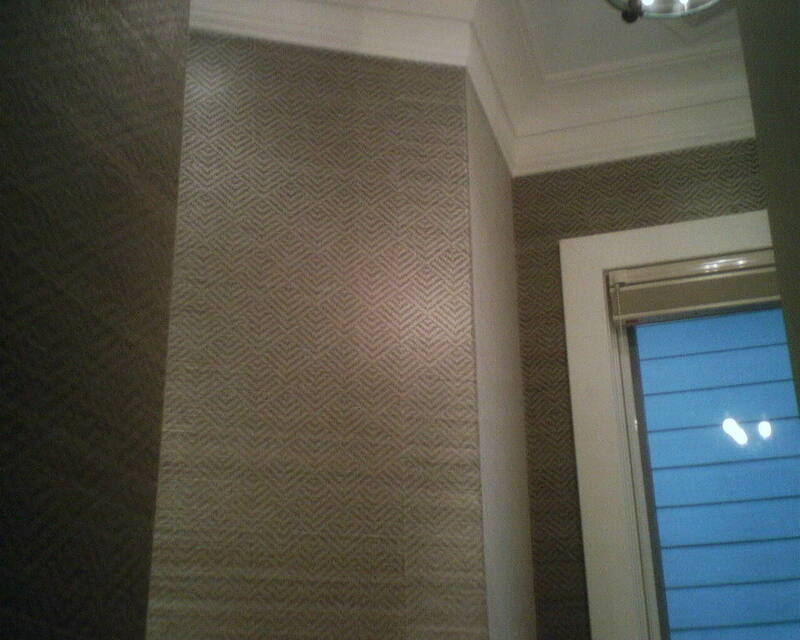 I hung this accent wall in a home office in Montrose four years ago, and was asked to remove the paper because the clients are moving and want a blank slate for the new residents. There was virtually no damage to the wall, either. The primer I used four years ago was oil-based KILZ Original. It is a super product for this purpose. If you are interested in stripping wallpaper yourself, there are step-by-step instructions on a page listed to the right side of my blog page. 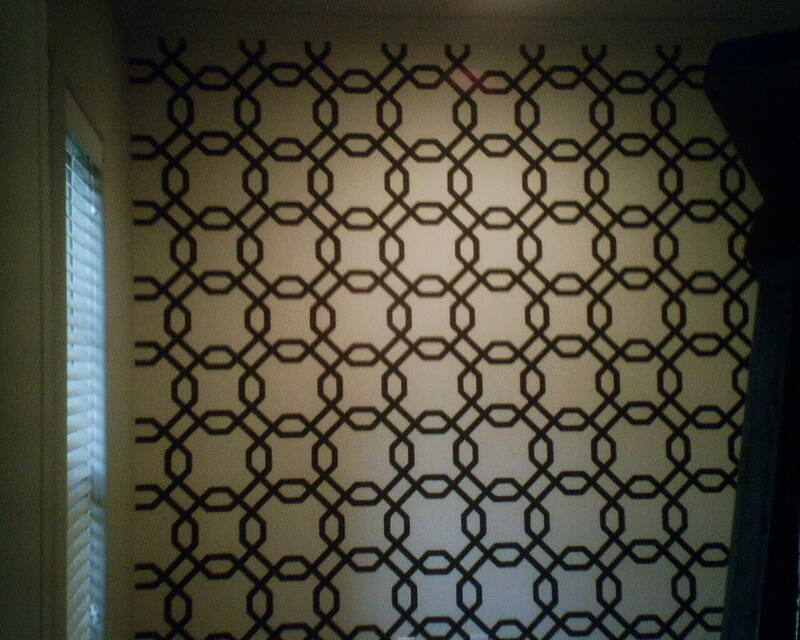 The geometric at the top was an accent wall in a home office, the soft trellis was in their dining room (the dark spot is where I have wet it to start softening the paste as part of the removal process), and the large motif was an accent wall behind their bed in the master bedroom. 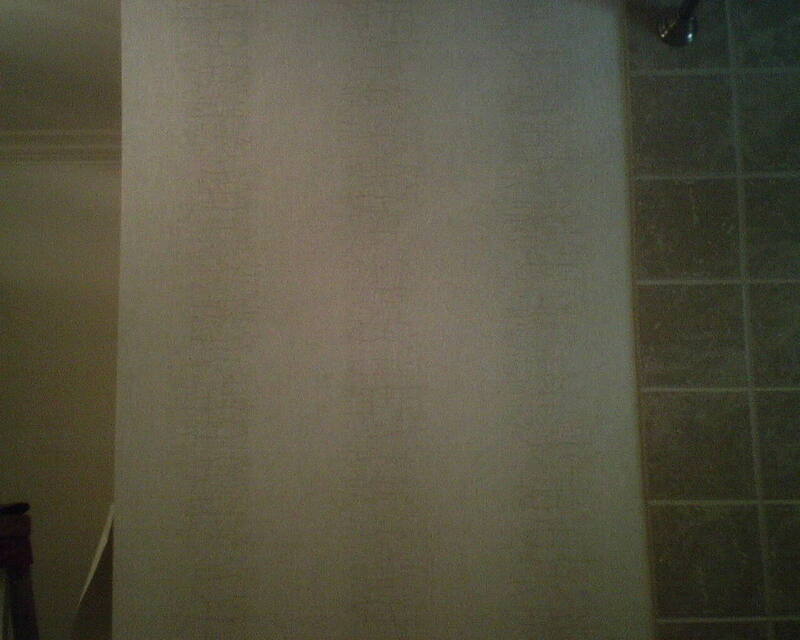 Here is a pre-pasted, paper-backed, solid-vinyl wallpaper that has been in a bathroom for 10-15 years. I am not fond of these papers in humid areas, because moisture tends to find its way into the seams and cause the paper backing to swell and expand, which causes the vinyl surface to bend backwards, causing a curled seam. This room does not receive a lot of humidity, so the seams still looked good. 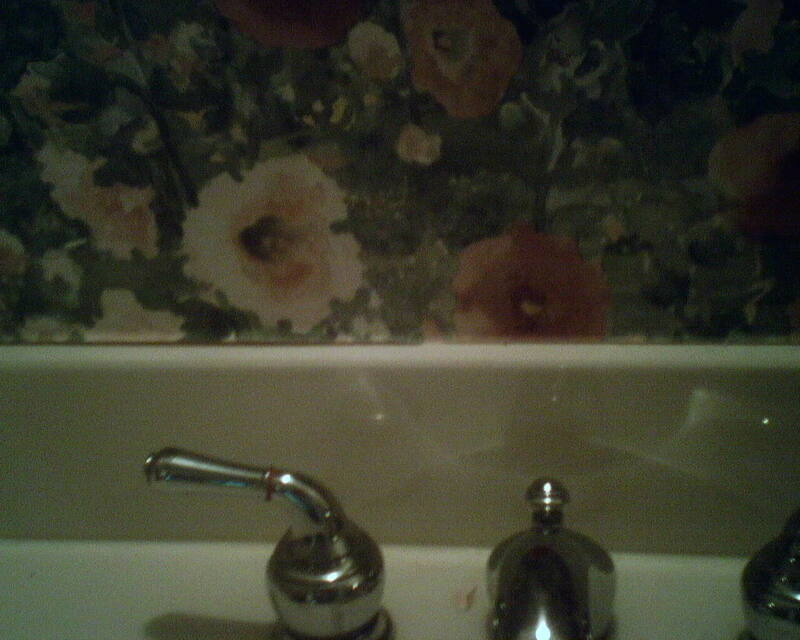 However, along the top of the sink, where water splashes and sits, water was able to wick under the wallpaper and soak into the paper backing of the vinyl wallpaper. 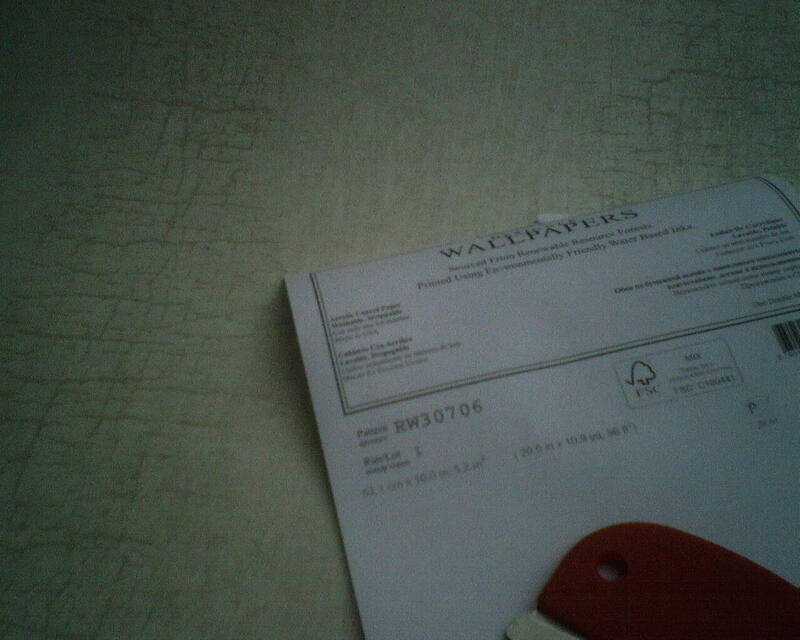 The paper stretched and curled, as you see along the top of the backsplash. My solution, or, rather, prevention, of this is to run a bead of clear silicone caulk along the top of the backsplash where the wallpaper meets it. 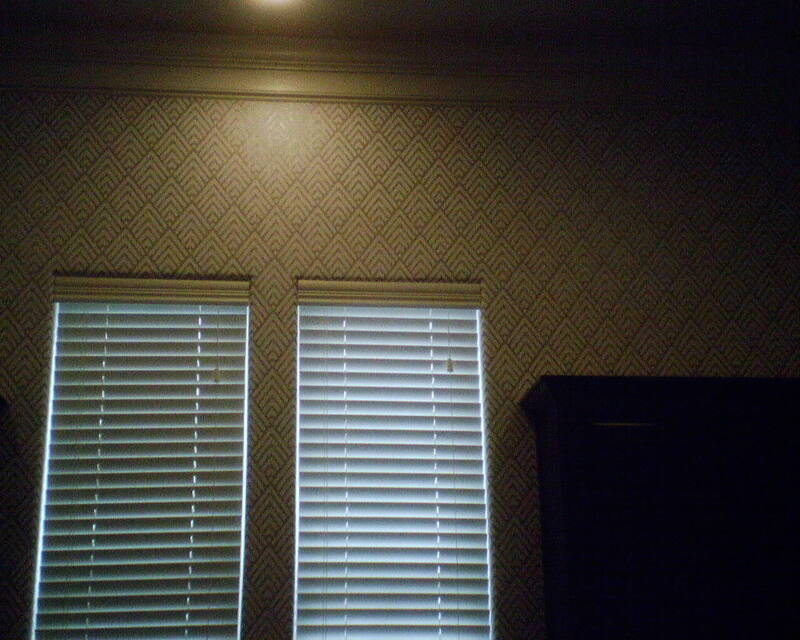 This prevents water from being wicked under the wallpaper, and should prevent curling seams for years to come. Yesterday I did the smoothed the wall and primed; today I put the paper up. It was just one wall, 5 single rolls, but took five hours. The homeowners were out of town, and left me a key, and I really appreciated the quiet, empty house, free of distractions, because that allowed me to concentrate on my footing, balance, movements, placing the pattern where I wanted it (see shot between the windows), etc. 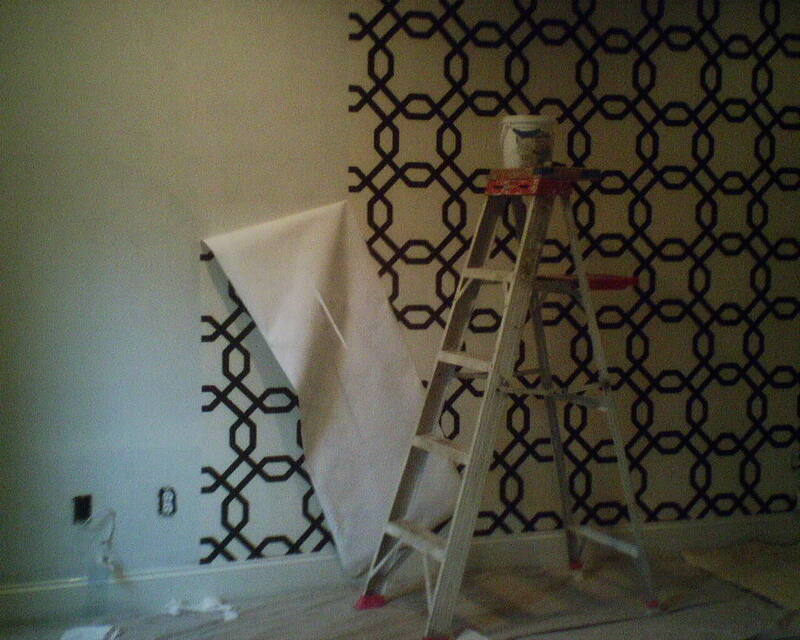 Interestingly enough, this pattern is almost identical to the one I hung two days ago (see post). This one has a slightly shimmery silver design on a white background, printed on a non-woven substrate. It was supposed to be paste-the-wall, but for many reasons, that would have been very cumbersome while dealing with the extension ladder, so I pasted the back of the paper instead, and it went very nicely. 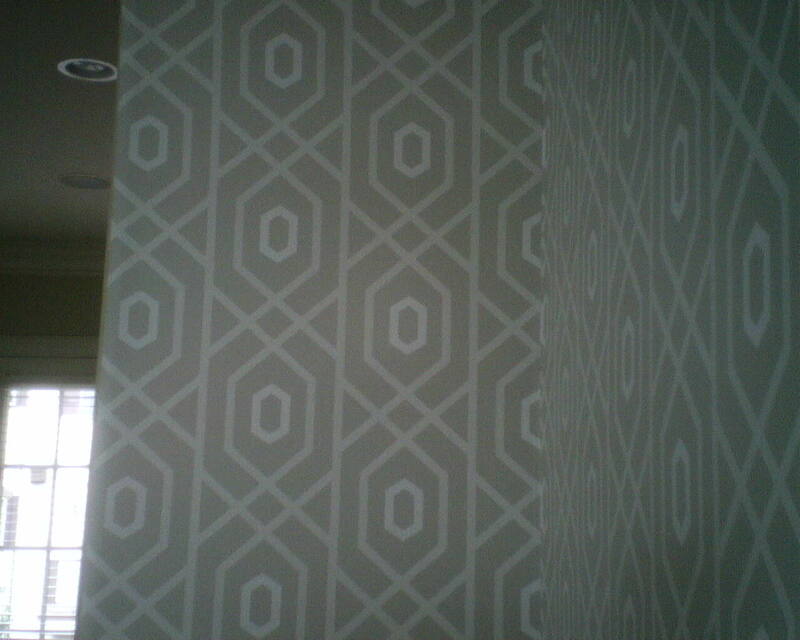 This wallpaper is by Brewster, and was bought at a discounted price from Dorota Hartwig at Southwestern Paint on Bissonnet near Kirby. (713) 520-6262 or dorotasouthwestern@hotmail.com. Discuss your project and make an appointment before heading over to see her. 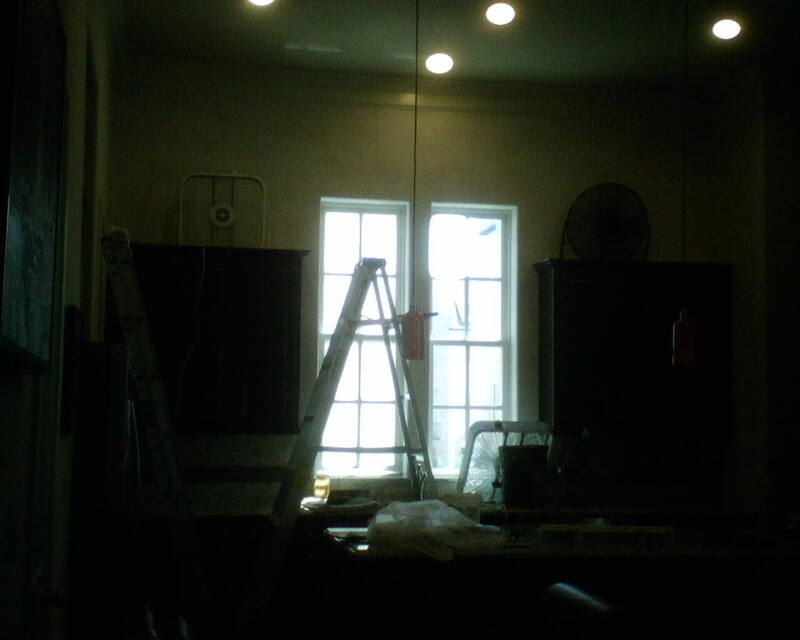 Today, I am smoothing a textured wall, so it will be ready to receive wallpaper tomorrow. The thing is, this wall is very high – 14′ or so – and so access requires an 8′ stepladder and a 16′ extension ladder. In this photo, I have troweled on the smoothing compound, and now am waiting for it to dry before I can sand it smooth. It helps to have fans blowing on the smoothing compound, so this is what you see in the photo. The thing is, because the walls are so high, I’ve had to place the fans up on top of the kitchen cabinets, so they can direct their moving air onto the walls that need to be dried. All this is more complicated than it sounds, because I have to climb up the wobbly extension ladder, making sure it does not touch / rub against the top of the cabinets, and hold on with one hand while my other hand carries the smoothing compound, or, as in the photos, the (heavy and unwieldy) fans up the ladder. The fans have to be placed on top of the cabinets (previously measured to be sure they had enough space to fit), and velocity adjusted, to be sure they would not vibrate too much or topple off the cabinets. All this to get the smoothing compound to dry. 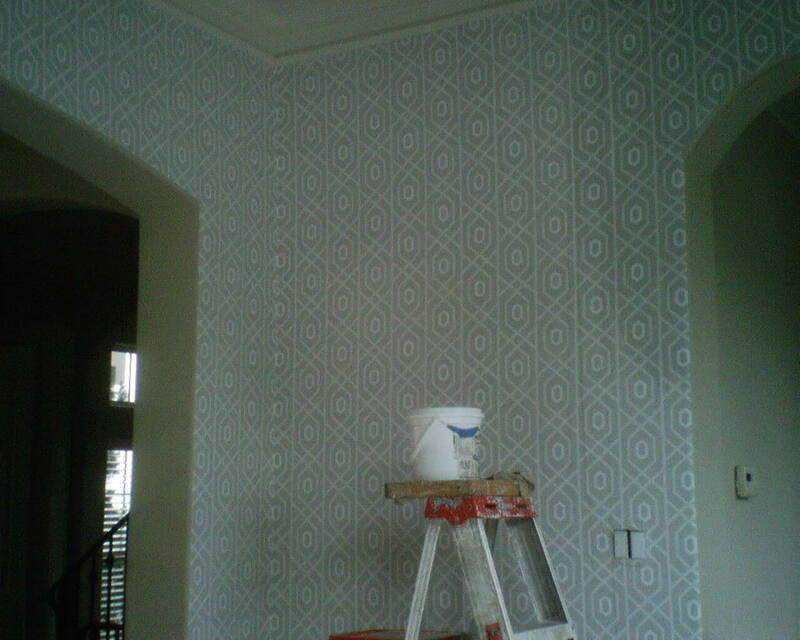 This is just one step among many in getting this wall prepped and ready for wallpaper. Sanding, vacuuming, wiping, and then priming the walls with a very watery, drippy sealer were other challenges to the prep of this wall. The clients are out of town, and have provided me with a key. I love this, because I can work in total quiet and solitude, and can concentrate on my footing and balance and weight distribution and etc. 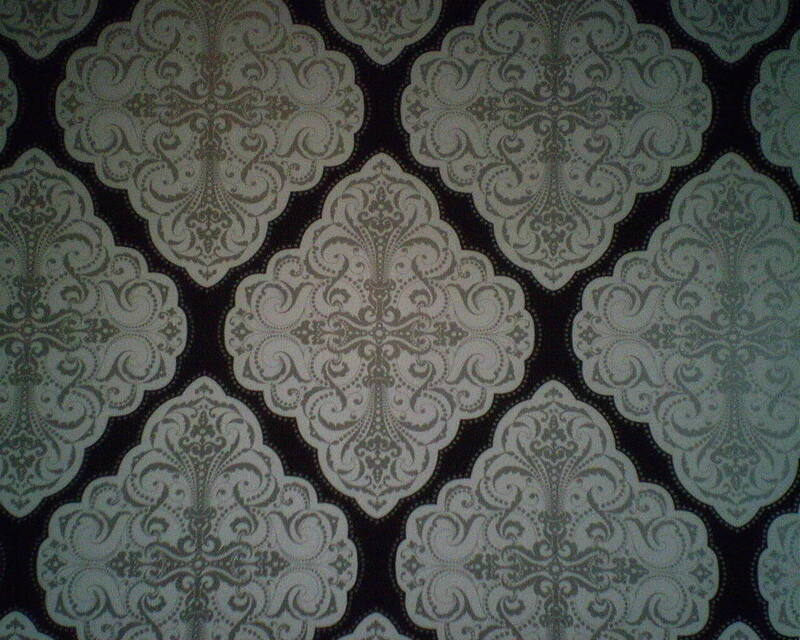 The wallpaper will go up tomorrow, so watch for more photos then. Apologies for the dark photo. 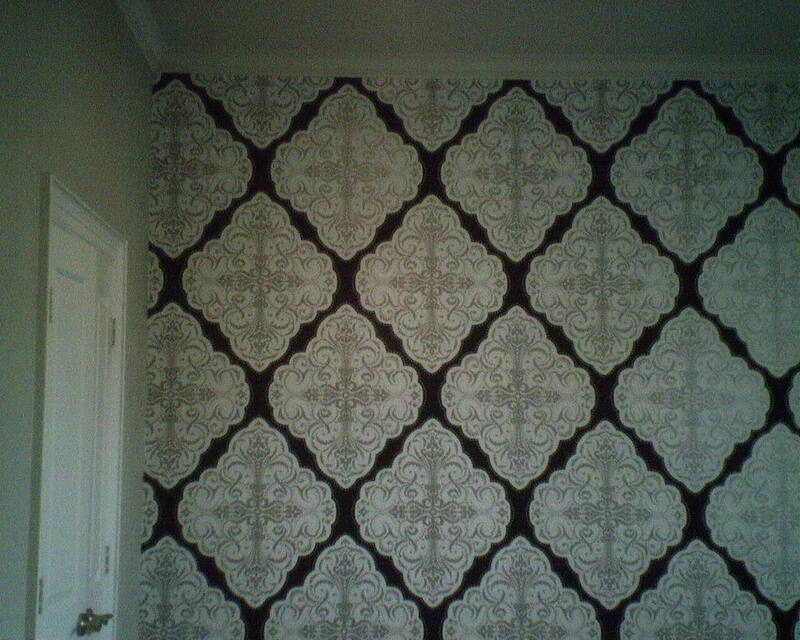 My lady clients are usually thrilled at the idea of wallpapering their rooms. Their male companions, on the other hand, are often reluctant, mostly because they think wallpaper is all flowers and chintz and gooey froofroo. Not anymore – today, there are plenty of gender-neutral selections. Some options are geometric patterns, textured goods, and neutral colors. 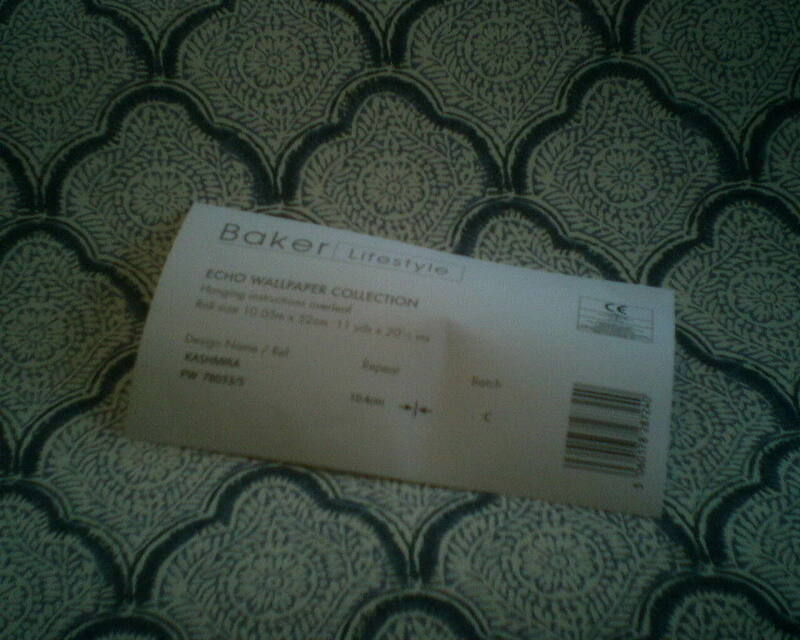 This paper is a good example of a geometric pattern on a textured medium (grasscloth), in a neutral color. 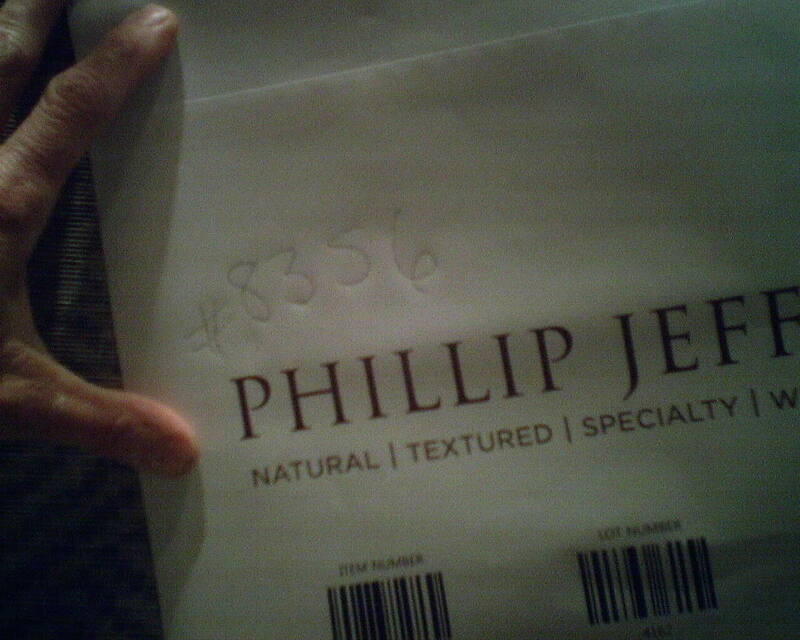 This finely textured grasscloth is by Phillip Jeffries (pattern #8356), a higher-end brand. There is a bit of a shimmer to the background, and a fuzzy diamond motif imposed on top. In the close-up shot, you can see some of the color variation between strips, that is common with these natural products. There is also a small bit of fraying at the seams, because when the strips are cut at the factory, the strings are also cut, and, well, there is nothing to hold them down tightly to the paper right at the edges. This is not very noticeable at all from a few feet away. I hung this in a powder room with 12′ high ceilings in the Rice Military neighborhood of Houston. This poor couple in a home near Tanglewood, Houston, started the remodel of her master bathroom more than a year ago, and they have been living in disarray ever since (a pretty common story 😦 ). 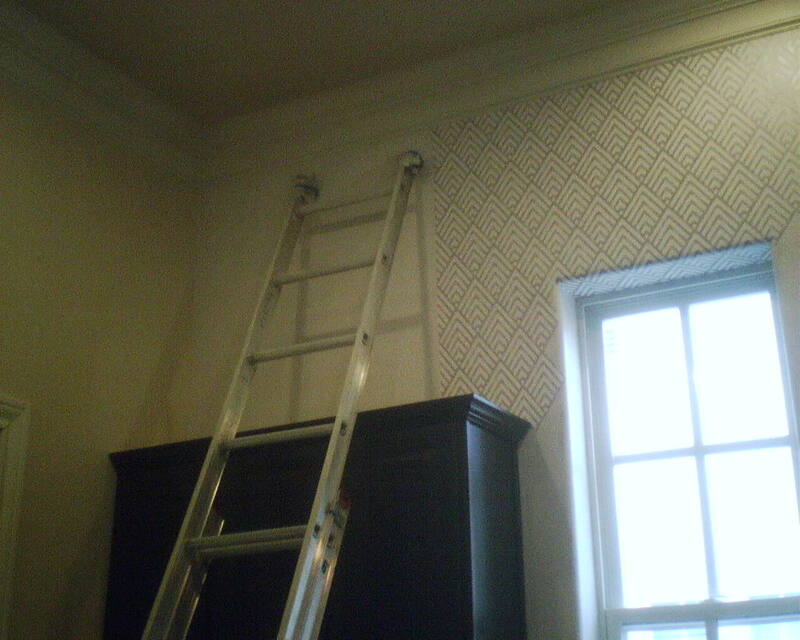 Wallpaper is one of the last elements of the job, so they are now almost finished and able to get back into the room! This is a subtle stripe pattern with a faux crackle finish motif – quite unusual. 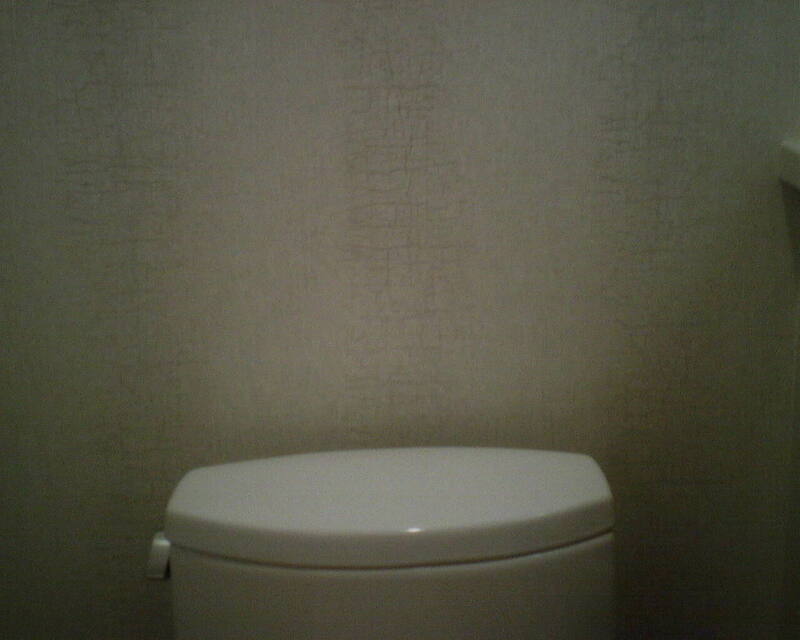 It compliments their tile and paint very nicely. The homeowner had asked me to place the pattern so that the “crackle” design would not fall against the shower tile, because she thought the tile and the wallpaper looked too much alike. I was happy to accommodate this request. But I was also concerned about how the stripe pattern would play out across the various walls. Once that first strip is hung, all the other strips – and the stripes on them – pretty much have to fall where the geometry dictates. 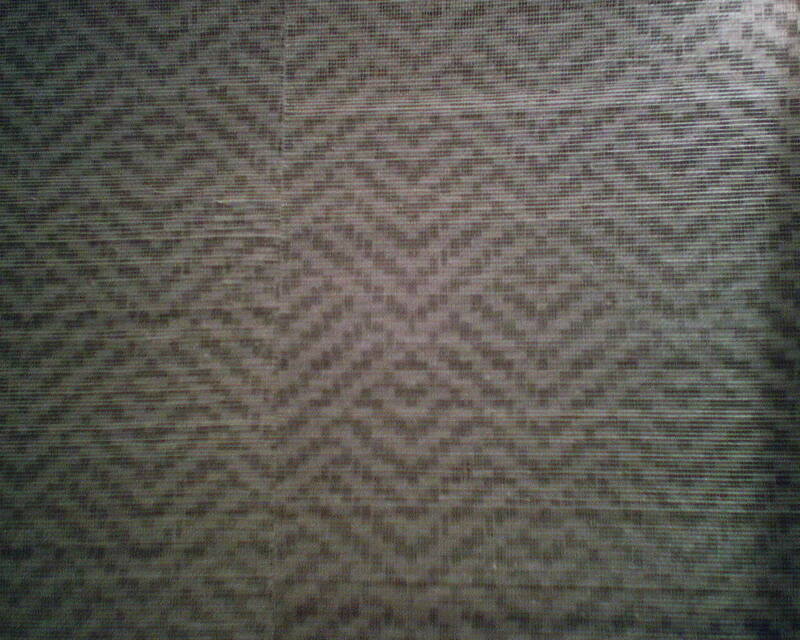 But because the pattern was “fuzzy,” I was could play with it a little, and was able to manipulate it so that the stripes were centered on four key walls – on the wall next to the shower tile (shown), behind the toilet (shown), on a wall next to the closet, and on the wall with the sink. This wallpaper pattern is by Designer Wallpapers, and was a dream to work with. It will hold up well in this bathroom. It was bought at a discounted price from Dorota Hartwig at Southwestern Paint on Bissonnet near Kirby. (713) 520-6262 or dorotasouthwestern@hotmail.com. Discuss your project and make an appointment before heading over to see her. You are currently browsing the Wallpaperlady's Blog blog archives for May, 2016.